Do you only want Fire and Thunder? Or maybe Light, Dark and Earth? Now you can pick and choose only the elements you truly care about. Each zip 'by element' contains both possibilities of carpools, Ancient vehicles or Regular (modern cars), and they override each other, so please use ONLY ONE of those pet careers for each element. Also, those zips all come with a folder filled with the Ancient carpools. You don't need it if you only play the Regular pet careers, and you don't need multiple copies of that folder if you play the Ancient ones. ...as HELPERS? Taking part to the adventure, or even to the battles? 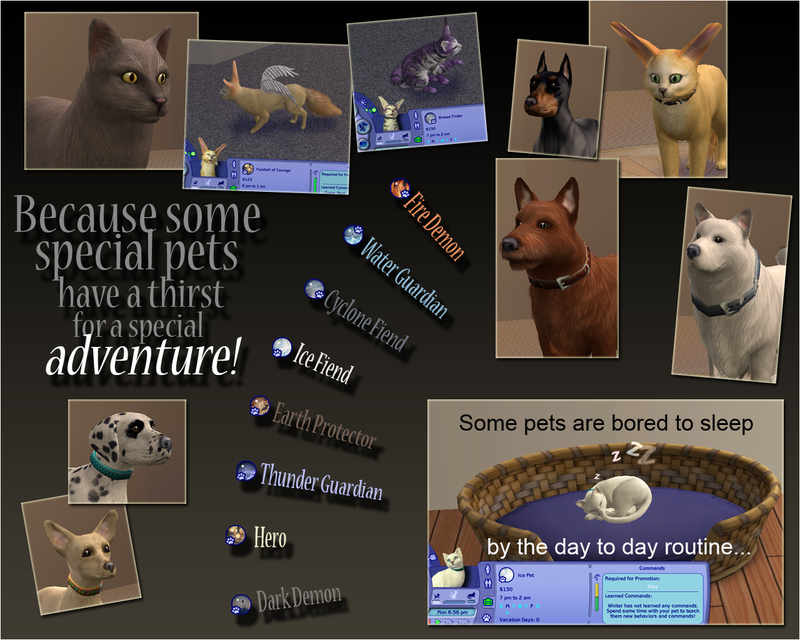 How would you like Pets able to handle the Elements*? Water, Fire, Wind, Darkness, Energy, Ice, Earth and Light. They are all English-only, but the right career will show up, no matter what language you play your game in. There's pretty little orb-like Custom Icons for each career, and there's Chance Cards for all levels. Not like the Maxis ones - try them, they're worth it. Just be careful what you pick depending who you are. For example, a Dark Demon should never reject a fight, an Ice Fiend takes a bad risk by hanging out with a Fire Demon, and a Hero should not get involved with a pet who has evil plans. There's two versions, one uses the normal Maxis carpools, while the other uses Hexameter/Fennshysa's Ancient vehicles as carpools, which are the Horse, Rendez-Vous Handsome and Victorian Coach. Every career has its unique GUID and won't override anything, except the Ancient vs Normal same career WILL override each other. For example, the Fire Demon Ancient career WILL conflict with the Fire Demon Normal career - if you install both, one of them will not show up in the game. So please use one version at a time. You can use 4 Normal and 4 Ancient if you want variety, just don't use two versions of the same element. *These are simple careers, and they don't give your pets real special powers. It could get really annoying if they did. Description: Oh, you're really cute, dressed like that. You look like a little cloud. Or clown. Keep trying. Really. Don't give up. Description: Yikes, yikes, and yikes again. Your mini thunder bites pinch just a little, but you do it a lot, so it does make a difference with the accumulation. You are on the way to become a useful part of a team of adventurers. Description: You're now strong enough to team up with Wyverns and be useful to them. Or even fight one. Description: The storms are on your side, always. And your opponents hate you because you kill them in a flash while they can't even touch you. Description: Are you able to put ice cubes in drinks? No, really. You have to start there. Description: You're a cold-hearted one. Your opponents are only starting to find out. Description: You freeze your opponents in their tracks and then you do whatever you want of them. Description: You are so icy cold, you bring the winter with you, no matter where you go, freezing everything on your passage. Description: You want to burn things. You really want to. For now focus on broken toys and spoilt foods. This is as far as it goes. Description: Ouchy, ouchy, and ouchy again. You burn just a little, but you do it a lot, so it does make a difference with the accumulation. You are on the way to become a useful part of a team of adventurers. Description: You burn of a strong desire to hurt your opponents, and your attacks do make a difference. You're now strong enough to be one of the best assets in a team of adventurers. Description: You're a one-pet army. You can burn 100 Zombies in a blink with your hot looks and flaming stare. Description: Oh, you're really cute, dressed like that. Keep trying. Really. Don't give up. Description: Ow, ow, and ow again. You bite just a little, but you do it a lot, so it does make a difference with the accumulation. You are on the way to become a useful part of a team of adventurers. Description: You're great at avoiding to get hit, and you're also good at taking your opponents by surprise. You're now strong enough to be one of the best assets in a team of adventurers. Description: You're a one-pet army. They all praise you. Just as well - you love them all so much. Description: You little meany. You want to hurt things. And people. You really want to. For now focus on broken toys and spoilt foods. This is as far as it goes. Description: You burn of a strong desire to hurt your opponents, and your attacks do make a difference. You're now strong enough to be one of the best assets in a team of adventurers, if they trust you NOT to hurt them. Description: You're a one-pet army. They all fear you. Just as well - you despise them all so much. Description: Protect the little bunnies. Don't let them get lost. Don't eat them. Description: Ow, ow, and ow again. You bite just a little, but you do it a lot, and there's poison in your teeth, so it does make a difference with the accumulation. You are on the way to become a useful part of a team of adventurers. Description: You're now strong enough to team up with Golems and be useful to them. Or even fight one. Description: Mother Earth herself calls you to be her one-pet army. You are the new Gaia Protector. Description: Your job? Finding where the winds come from. Each and every wind, separately. Listen to them attentively. Description: You're fast enough that you can run away from any situation. And avoid getting hit, too! And take a quick, quick bite at your opponent once in a while. Description: Not only are you good at avoiding to get hit, you're also good at taking your opponents by surprise. You see without being seen, and attack without being exposed. Ninja Pet! Description: The wind is on your side, always. And your opponents hate you because you kill them fast while they can't even see you or touch you. Description: Take good care of the little Goldfish. Don't let it drown. Don't eat it. Description: Splash, splash and splash again. You can almost extinguish a fire, just you alone. Description: You can now extinguish fires just you alone, because you're so cool. You can also teach lessons to Fire or Energy creatures more efficiently than anyone else. Description: You're the Guardian of all Tsunamis. And Goldfishes! Water is your friend, you love it. All water creatures love you. Fire and Energy creatures think you are their worst nightmare. Thank you for checking it out. Have fun! Hexameter and FennShysa for the vehicles and permission to use them for Career uploads. MTS, for the opportunity to share with others!